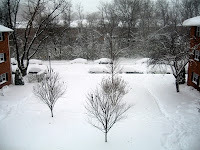 So exactly two weeks ago, on December 5th, I took the following picture out of our living room window. I meant to blog about how my first East coast winter was officially beginning, and make some point about how much more awesome California winters are. Then a giant cold front hit California, and all my OC friends complained on Facebook about how they had to wear sweaters AND coats when going outside. There was frost on the grass and scarves where a necessity! 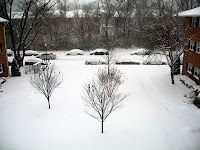 At that point, my blog post about one day of snow on the East coast seemed a little anticlimactic, and I shelved the pictures. But! Now DC is experiencing THE STORM OF THE CENTURY!! Or so the local news would like us to believe. A couple of days ago, the weather people were saying we would get maybe 6 inches of snow over the weekend. As the week wore on, these predictions grew hysterically, until yesterday the guy on the country radio station was screaming about 25 inches of snow. Flights in and out of DC were cancelled, and when I stopped to buy shampoo at Target yesterday afternoon, I was nearly run over by panicked shoppers grabbing toilet paper and bottled water. I was distinctly out of place waiting for the cashier with just one paltry item in my hands. 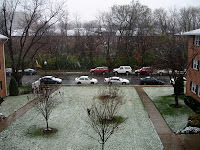 As the afternoon has worn on, the snowfall has not abated, and in fact seems to have increased. I took the following picture a few minutes ago. As you can see, despite the snowplow going through this morning, the street is pretty well covered, and the cars mostly buried. It appears we aren't going anywhere for a bit, so I suppose that it's a good thing I feel uncomfortable with less than two weeks worth of delicious dry goods in my pantry at any one time. We have plenty of food and toilet paper, so no last minute panic was necessary here, even if I had been less smug about the weather predictions. The Pit is currently baking some fresh bread, and I've got a pot of soup going on the stove. If you need us, we'll be celebrating our first snowstorm together by cuddling on the couch and watching the snow fall. And fall. And fall. You should probably send for help when the blog posts stop. The frantic hoarding of toilet paper happens whether they're calling for 25 inches or 0.25 inches. The DC area is right in the sweet spot where large snowstorms do happen occasionally, but not often enough for people to act sensibly when they do. Sadly I am trying to fly home tomorrow. Hopefully they'll have the snow cleared out by then. Hope you get to fly in tomorrow. We could use your assistance at trivia on Monday.